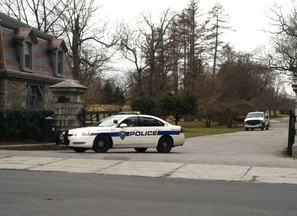 Police at Lyndhurst following the discovery of a body on shore. Credit: Daily White Plains. The body was discovered Wednesday afternoon washed up on the rocks on the Hudson River shore of Lyndhurst, the National Trust Historic Site in Tarrytown, Scott Brown chief of the Tarrytown Police said. Brown referred further questions to the New York State Police, saying that department would have jurisdiction over the body. A spokesman for the state police said that his department would normally take jurisdiction if the body recovered was thought to be someone who had jumped off the Tappan Zee Bridge. It’s days like these that we begin wistfully thinking about a different career. This entry was posted in Uncategorized and tagged Lyndhurst on February 16, 2012 by Max van Balgooy. I have been asked 3 times during my career for permission to spread human ashes at the historic sites that I have administered. They all have gardens, so I didn’t think this unusual. Permission was given in all three cases and I know of at least two other times when the ashes were spread – supposedly – without my knowledge. Frankly, I much preferred when they just went ahead and did it, because the paperwork and research involved when someone asks is very burdensome.